It is impossible to overlook the intensity and extent of excavations with heavy machines in the Bela river, Slovakia. The European Wilderness Society is concerned that this is also happening on the tributaries of the river. Particularly in the Tichá and Kôprová Valleys, inside the strictly protected zone of the Tatra National Park. “The concern is so great that the European Wilderness Society launched a process to remove the Belá WILDRiver from the European Wilderness Network”, said the Deputy Chairman of the European Wilderness Society. The 16 km of Belá WILDRiver were subject of a European Wilderness Society Quick-Audit in summer 2017 and met the Bronze Wilderness Quality Standard. Auditors were already concerned about the ongoing extractive uses back then. Particular fishing in the lower part of river. However, the current situation is beyond any limits. 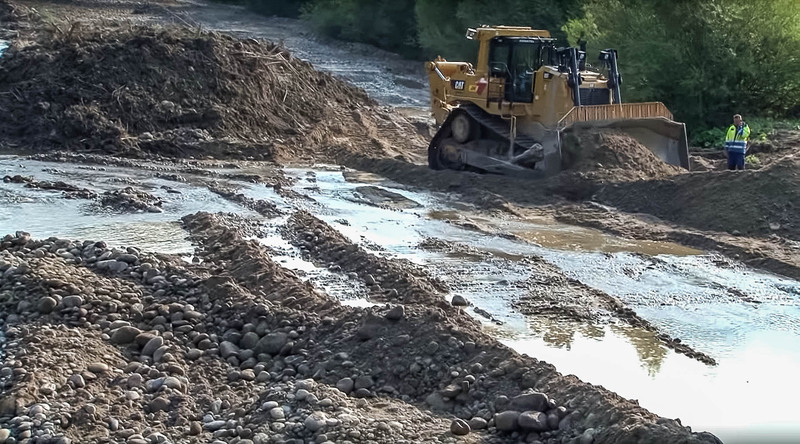 Heavy machinery, like caterpillars, working in the river bed of this last wild river in Slovakia is simply not acceptable. The undevelopedness, undisturbedness as well as the naturalness of the river are under extreme threat. This puts the question if the Belá River should be excluded from the European Wilderness Network on the desk of the European Wilderness Society Advisory Committee. The Belá WILDRiver is part of the 22 km long Belá River and is partially embedded in the Tatra National Park. Long periodes of high temperatures interrupted by extremely heavy storms and rainfall characterised this summer of 2018. These heavy rainfalls caused sudden swells of the water level leading to cut banks and the development of new river beds. Such dynamic processes are typical for a wild mountain river such as the Belá WILDRiver. Changing water levels and floods leading to sediment deposits and changing river beds are part of natural river morphodynamics. These natural dynamic processes of changing river beds are essential for a long-term natural flood protection. The European Wilderness Society together with the European Wilderness Society Advisory Committee is currently discussing and reviewing the certification of the Belá River as a WILDRiver. said the Chairman of the European Wilderness Society. The pictures in this post have been contributed by Mr. Paca and Mr. Kalisky.